Whenever I plan a family vacation, there are several websites I always check while mapping our our itinerary. I do this whether we’ll be driving thousands of miles or staying close to home, whether we’ll be gone for three days or three weeks, whether we’ll spend all our time in one place or traveling from city to city. 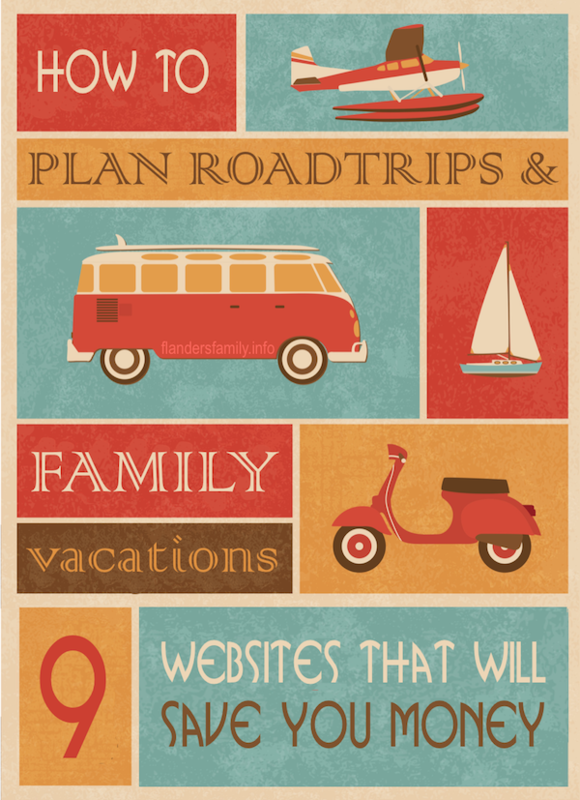 We have a big family, so it is usually more economical for us to drive than to fly (unless, of course, we’ve used frequent flyer miles to get free airfare, as when we earned ten free tickets to Europe); therefore, most of these sites are specific to US travel. As homeschoolers, we do most of our traveling during the off-season (while school is still in session), so we gravitate toward activities that are both fun and educational. In that sense, most of our vacations are “learning” vacations. I love this factory tours website. Click on the state you plan to visit, and it will pull up a listing of all the businesses within its borders that offer factory tours — many of them for free. Over the years, our family has toured glass factories, pecan groves, chocolate factories, tea plantations, and many others, most of which I found through this website. We normally buy a family membership to our local zoo every year. With a crew as big as ours, it pays for itself within two visits and also gets us discounted admission to zoos all across the country. I keep a printed copy of zoos that participate in the reciprocity program and cross-reference it when vacation planning. It’s worth checking the list, even if you aren’t a zoo member, as it includes a lot of zoos (highlighted in green) that are free to the general public, as well. We also buy an annual membership to our local science museum. Not only does this give our family unlimited visits all year long, but membership grants us free admission to hundreds of science museums across the country. You’ll find a list of currently participating museums here. Almost every trip we take includes a (free) visit to at least one museum on this list. They are all different, and our kids have had a blast and learned a lot exploring the couple dozen we’ve visited so far. Many of our National Parks offer free admission, in addition to wonderful museums, educational videos, and interactive exhibits in their visitor’s center. Your children may also enjoy completing a short workbook to earn a badge in the Junior Ranger Program (which is often free, as well). Check the National Park Service site to see what parks may be near your next vacation destination (or en route to it)! We do not always have an annual membership to a garden listed with the American Horticultural Society, but we’ll occasionally join the Dallas Arboretum or Garvan Woodland Gardens. On years that either of those memberships are current, I check their reciprocity lists when planning vacations, so as to get the most of our membership. Many cities (like ours) have beautiful parks and gardens that are free and open to the public. I’d love to find a state-by-state listing of those places. If you know of one, please send me the link! In the meantime, I’ll keep searching this site, then clicking through to the individual garden’s website to determine admission policies (note that most of the gardens labeled “free admission” on the master list means free reciprocal admission for AHS arboretum members, not necessarily free for everybody). Of course, you have to eat while you’re on vacation. We normally choose hotels that serve breakfast (or stay in places with a kitchen so we can eat cereal in the morning and crockpot meals in the evening), but that still leaves at least one meal per day that we eat out. I make those meals count by finding restaurants that award us with airline miles, as well (typically 5 miles per dollar spent, but we sometimes get double that rate). To check your next vacation destination for participating restaurants, follow this link. If you select “map view” to look at the results of your search, you can easily locate the restaurants closest to your hotel or travel route. For more information on how this program works, read this post. I also check Restaurant.com to see if any restaurants in the place we’ll be visiting offer discount dining certificates. This is not quite as flexible as Aadvantage Dining and requires an upfront investment, but is well worth it when it helps you save as much as $100 off a $200 tab. Certificates are available in much smaller denominations, but we are normally feeding such a crowd that we go for the bigger discounts. Sometimes we can even find restaurants that accept dining certificates and award aadvantage miles — for a double bingo! I used to get frustrated with the Groupon site, as it seemed to mainly list offers that were of no interest to me. Then I learned how to use the site’s search bar: Just plug in the city you’re visiting and search for “FUN” — that will sufficiently narrow the results so that you don’t have to wade through pages of stuff you don’t want to find something you do. The couple of minutes it takes to scan the relative offers really pays off! For instance, it got us half price admission to WonderWorks last time we were in Myrtle Beach– a substantial savings for our big crew! Battleship IOWA in Los Angeles – the West Coast’s only Battleship open to the public. Your tour will take you on a journey through World War II, the Korean War, and the Cold War to experience the life of a sailor on the lead ship of the last class of gunships. My Readers GET $3 OFF Regular Tour Admission on Battleship IOWA – using code SCFG. GLO Miniature Golf in LA/Riverside – State-of-the-art, indoor, glow-in-the-dark mini golf course featuring hundreds of black lights that illuminate the course in a kaleidoscope of electric colors. Travel the world with our 27 ‘World Wonder’ themed holes. Go from the Great Pyramids of Egypt to the Running of the Bulls in Spain to Niagara Falls in New York all lit up by colorful glow in the dark paint. Make the experience even more fun with our 3D glasses, which make you feel like you are in the actual location. Taking a group? Mention this promotion to save 10% off your next party at GLO Mini Golf! Lip Smacking Foodie Tours hosts award-winning food tours with visits of up to 5 of the top restaurants on the Strip or Downtown. Guests are VIP’s with immediate seating, 3-4 signature dishes at every restaurant and a guided walking tour between stops packed with insider information on Las Vegas and the sights along the way! Marvel’s Avengers S.T.A.T.I.O.N. is an immersive experience that brings guests into the world of The Avengers. Welcoming all ages, guests are given access to an array of intelligence files while training to become an agent of S.T.A.T.I.O.N. On display is an extensive range of original props and costumes from the Avengers movies, such as Captain America’s shield and costume, Hawkeye and Black Widow uniforms and weapons, and many more. Gt 20% off tickets Marvel Avengers S.T.A.T.I.O.N. Get 20% off tickets with this coupon. Mat Franco’s Magic Reinvented Nightly– a fun and feel-good twist on magic that defies all expectations. Fresh from his triumphant win on America’s Got Talent and his follow up primetime special on NBC in 2015, Mat presents an unparalleled production and innovative approach to magic-making that’s driven by his passion and imagination. With his signature brand of breezy humor, Mat mixes his amazingly inventive and stunning magic with crowd-guided improv, creating a once-in-a-lifetime adventure that’s unique and unforgettable to each audience. Get special family pricing with this coupon. Madame Tussauds Las Vegas – Located on the Las Vegas Strip, under the Venetian Bell Tower, Madame Tussauds invites you to pose with countless figures of internationally renowned musicians, A-list celebrities, sports legends, world leaders, super heroes and more. With several newly renovated spaces, the world famous interactive wax attraction is bigger and better than ever! Get $5 off your admission to Madame Tussauds Las Vegas when you present the box office with this coupon. The Range 702 in Las Vegas – the ultimate shooting experience, very local friendly. Educational classes; Intro to handguns, shotguns, CCW permits and many more. Receive one hour free range time with this coupon. The Mob Museum in Vegas – Critically acclaimed, unflinchingly unique, globally respected and beloved by locals, The Mob Museum, the National Museum of Organized Crime and Law Enforcement, in downtown Las Vegas reveals an insider’s look at the events and characters of the continuing battle between the Mob and the law. The Museum offers a provocative, contemporary look at this fascinating topic through high-tech theater presentations, more than 2,000 iconic one-of-a-kind artifacts and interactive exhibits. Named one of “10 Places Every American Should See” by Huffington Post and one of “12 Can’t Miss U.S. Museum Exhibits” by USA Today. Black Canyon River Adventure – Smooth water rafting on the Colorado River in the Black Canyon National Water Trail. The trip starts near the base of the Hoover Dam and spends 3 hours traveling 12 miles downstream to Willow Beach Marina. Experience the amazing views of the Hoover Dam and the Bypass Bridge. You will see waterfalls, hot springs and other geological wonders, possibly spot Desert Big Horn sheep, Osprey, Eagles, Great Blue Heron and much more. The trip is fully narrated by experienced, knowledgeable guides who offer incredible knowledge of the history of the dam and the area. Lunch is included. Urban Adventure Quest – turns Houston (or your choice of 45 other major cities) into a giant game board with a fun scavenger hunt adventure. Combine the excitement of the Amazing Race with a three-hour city tour. Guided from any smart phone, teams make their way among well known and overlooked gems of the city, solving clues and completing challenges while learning local history. Play anytime during daylight hours. Start when you want and play at your pace. Great Family Fun. Sign up online and use promotion code FGCOUPON to save 20% – Only $39.20 for a team of 2-5 people. Tilt Studio Family Entertainment Center – hosts a variety of games and attractions that appeal to people of all ages. Buy one attraction at regular price, get one attraction FREE with this coupon! Attractions include: Laser Tag, Black Light Mini Golf, Mini-Bowling, Tilt-A-Whirl Ride, and Outrun SP Deluxe Race Cars. Wet’n’Wild SplashTown – Houston’s largest and closest water park with over 80 acres of water park Fun. We’ve spotted this park several times when we were in town visiting my son in medical school, so I finally looked it up. It features over 42 rides and attractions, including water ride thrills with names like Tornado, RipQurl, Texas Freefall, and the Big Kahuna, “an unforgettable mega-thrill raft ride that blasts through a whitewater journey filled with alternating tunnels and plenty of twists and turns.” If that’s too much for our younger kids, they also have a new interactive children’s area and a flowing river, where two can relax, rest, and ride at once. Hollywood Wax Museum Entertainment Center in Pigeon Forge, TN – Pose with the biggest stars, while learning about their pets, pet peeves, and accomplishments. Ride up into the mouth of Great Ape and see the spectacular Smoky Mountains from the VIP Observation Deck (weather permitting). Find your way through the mirrored corridors hidden inside the Castle of Savannah to save Princess Hannah. Join the battle against evil at Castle of Chaos, the world’s first 5D haunted attraction. Flyaway Indoor Skydiving in Pigeon Forge, TN – The first and longest running vertical wind tunnel open to the public! No experience necessary, our instructors will be there to guide you as you spread your wings and learn to FLY! Get $5 off video service at Flyaway with this coupon. Louisville House of Boom – Over 10,000 square feet of connected, world-class trampolines in a 23,000 sq. ft facility. Our trampoline grid features over 60 trampolines, including the famous angled wall trampolines, launching decks and a few surprises up in the ceiling to test your vertical. If you are a blogger and are willing to share reviews of the places you visit with your readers, you may qualify for even bigger discounts to local attractions. Since that describes me, I usually check their current list of blog promotion offers when planning our road trips, as well. For information on registering your own blog with this program, follow this link. So that’s my list. What sites do you use to map out or save money on your family vacations? I’d love for you to share them in the comment section below! Vacation Planning is really tough sometimes. Thanks for sharing this it will helpful to me. We went to Alaska two years ago & were able to save a lot by just calling the places we were visiting & asking if they offered any discounts or coupons. The employee at the Alaska Railroad actually told me who to call to order my coupon book, then he went & picked it up so that I could book that same day (coupon needed to be presented when booking). So, talking to a real, live person helps too!